I don't know about your students, but ours were all about the Olympics at the start of the school year! They were inspired by the performances of all of the amazing athletes. 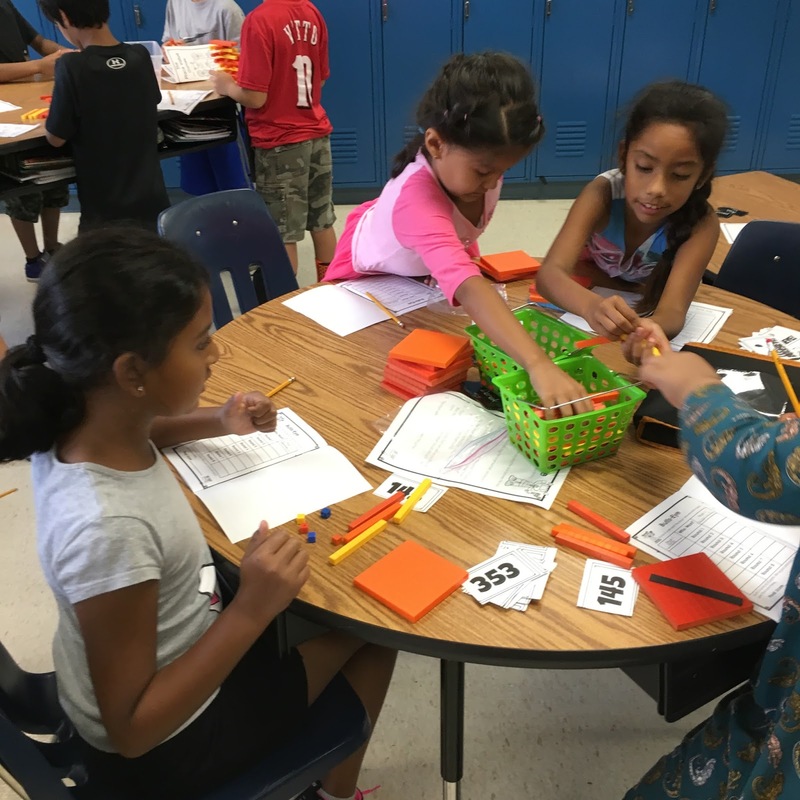 We thought it would be a good idea to channel all of that excitement into a fun math activity for the beginning of the school year, The Place Value Games! We knew that we wanted to do something that would be relevant in future years, even when the Olympics weren't taking place, so we decided to create interactive games that could be played any time. Our students had a blast competing against themselves and each other while getting in some great estimating and place value practice. In the end, we recognized the "high scorers" in each of the events. 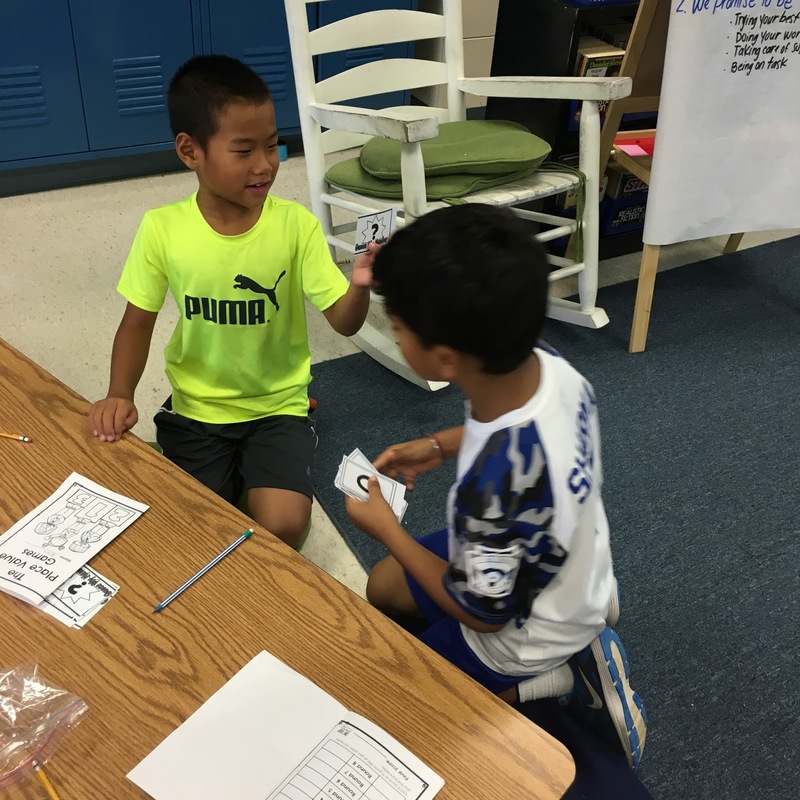 *Teacher tip: Introduce 1-2 games each day and let students have a chance to practice. Once they have had an opportunity to play each game, have a day where all of the game stations are available for the students to rotate through. Believe us, it will make your life a lot easier ;). 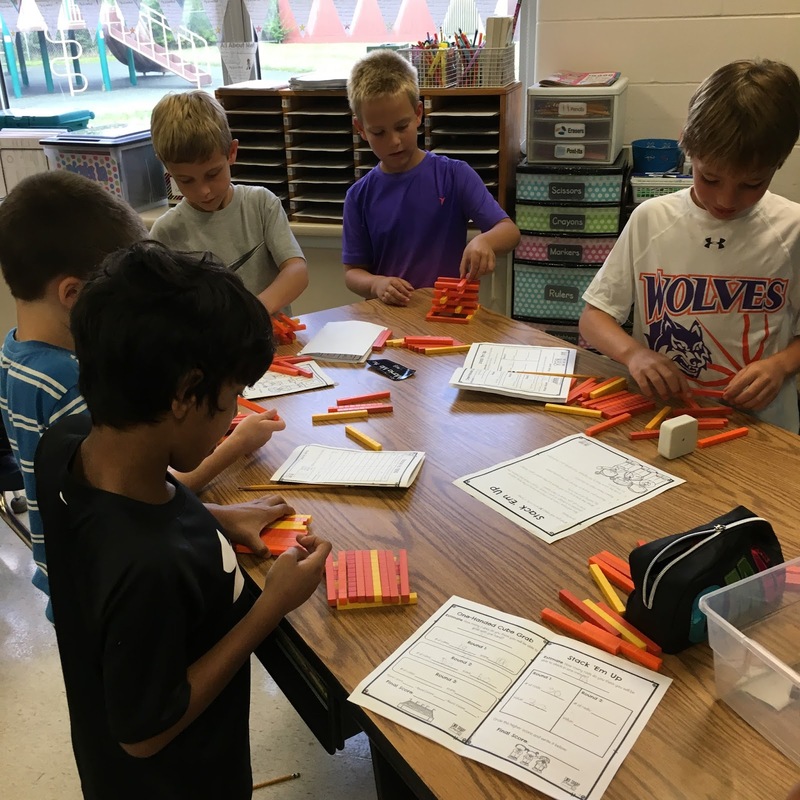 One-Handed Cube Grab- The students practiced their estimation skills by estimating how many ones cubes they could grab in a single hand. Stack Em’ Up- In this game, the students used their creativity and engineering skills to create a tower of tens rods within a one minute time limit. They practiced counting by tens as they determined the value of their final tower design. 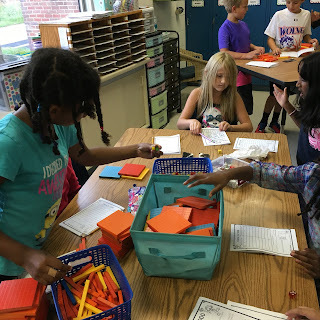 Bullseye- This was a fast paced number building game where the students raced to create a given number with place value blocks before their opponent. 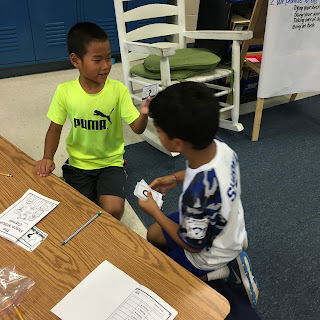 Guess My Number- The students worked to solve number riddles using number/clue cards. Race to 1000- A dice game that challenged the students to strategically use their knowledge of place value to reach 1000 without going over. 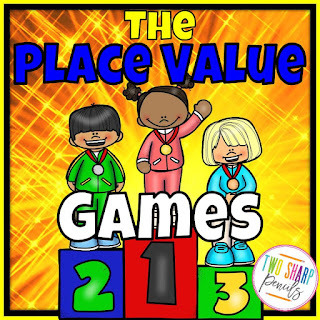 We had such a great time celebrating the Olympic Games and practicing our place value skills! If you want to host your own games, check out our product by clicking the picture below. 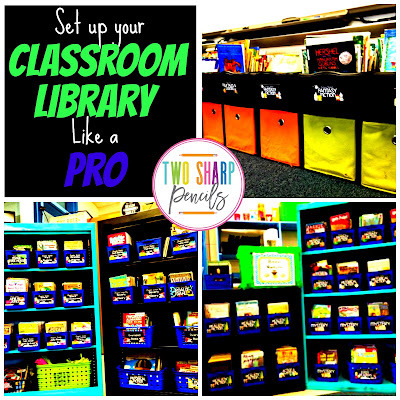 Set up your Classroom Library like a Pro! Garage Sales- people usually always have children's books at garage sales and you can usually find them for pretty good prices. We always make sure to let the seller know that we're teachers, and that we'll be using the books for our classroom library, and they usually give us a better deal. Sometimes they even let us have them for free! Another great idea is to leave your contact information with them and ask for them to donate anything that they don't sell after their sale is over. 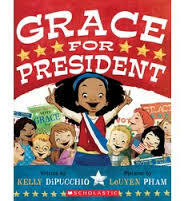 Scholastic Book Orders- our students always love when they see a new Scholastic book order in their mailboxes! It's really easy to sign up to receive these and you can earn free book credits for the books your students purchase. Scholastic Warehouse Sales- if one of these is being held near you, you have to go! Basically, Scholastic rents out a warehouse and sells tons and tons of books DIRT CHEAP! You can also volunteer to help during the sale and receive a discount on the books you purchase. Other Teachers- check with the other teachers at your school or in your district. Retiring teachers are often looking for new homes for their books. Other times, teachers will go through their own libraries and weed out any titles they don't need or have multiple copies of. Your Local Library- see if your local library ever holds sales for books that aren't in circulation anymore. Many times they will have a "Fill a Bag" sale where you can buy as many books as you can fit in a grocery bag for a low price. You can find a sale near you here! 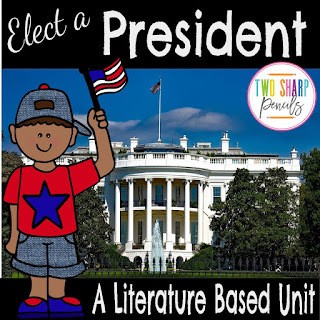 Ask your Friends and Family!- if you have friends that have older kids than the grade that you teach, then they probably have books that their kids have outgrown just laying around. I'm sure they would love to donate them where they would be put to use again. 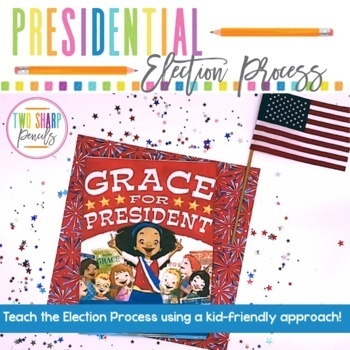 Birthday Books- if your school has strict rules about students bringing in treats for their birthday, then ask them to donate a book to your classroom library instead. 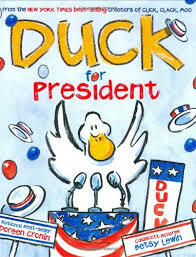 You can even let them sign a special "Birthday Book Plate" to place inside. To make them feel extra special, let the Birthday Kid do a book talk, or read the book to the class first. Check Facebook- this may sound like an odd combination, but Facebook has tons of selling groups and "virtual yard sales." You can even check for groups in your area to make pick up quick and easy. 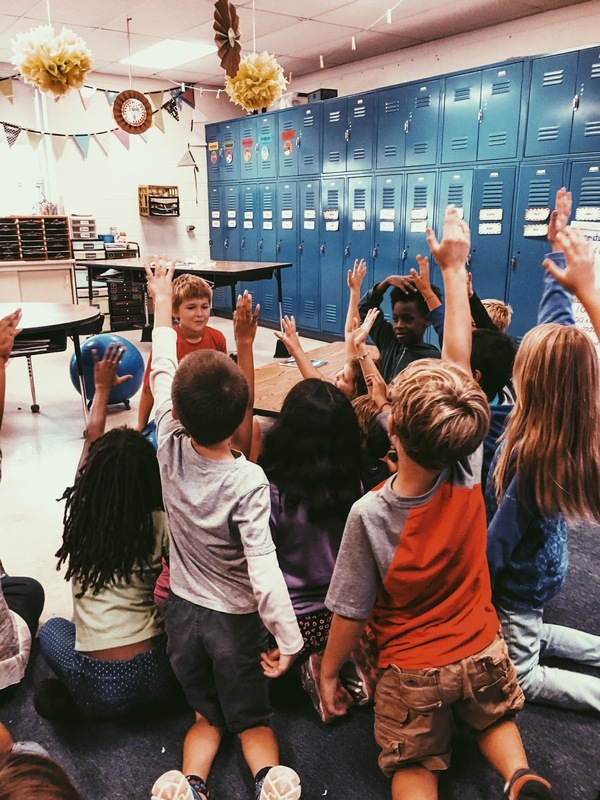 Donor's Choose- this is a great website where teachers can create a project, and others can choose to donate any dollar amount to help them fund their idea. The fun has just begun, time to organize! The first thing you'll want to do is stock up on matching baskets to house your books. We love these from Really Good Stuff and we love them because they're so heavy duty, but they are a bit of an investment. If you're on a budget, Dollar Tree and Target have excellent options too. Just make sure to pick a color (or two if you want to separate Fiction and Non-fiction) that makes you happy! Make sure that you purchase some bins that are skinnier (for chapter books) and some that are wider (for picture books). We've found that the best bins for picture books are actually dish pans and they're usually cheap too! Once you have books and bins, you have to decide how you want to organize. We've decided to organize by genre because we feel that it's more real life and how kids would see books organized if they walked into a bookstore. We also want our Third Graders to practice finding"Just Right Books" on their own. 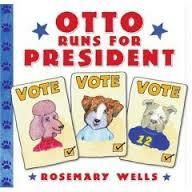 Other options could be: by subject/theme, series, or leveled by reading ability. 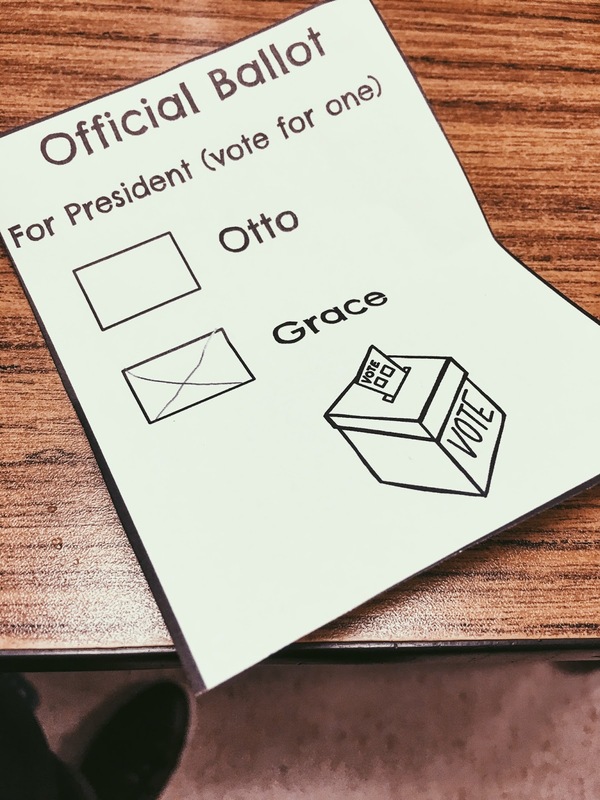 It really doesn't matter how you decide to organize as long as you stay consistent and think about what will work best for the age of students you teach. So now all of your books have a home in a bin! 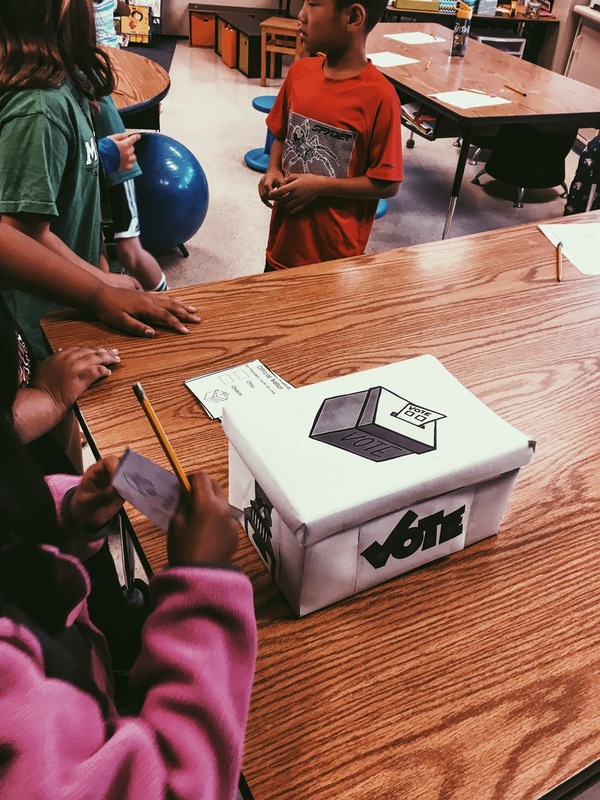 It's time to label those bins so your students can find books easily AND put them away correctly. There are lots and lots of options for library labels on Teachers Pay Teachers (6,191 of them to be exact!) We purchased these labels from Core Inspiration by Laura Santos because we loved the style, and she included everything we needed. You can find labels that match your classroom theme or colors as well. 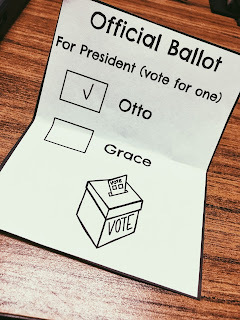 You'll want to print these out on cardstock or photo paper to make them a little more durable and also laminate them as well. It will take a while to cut all of those out, so prepare yourself with snacks and get ready to Binge-watch your favorite show on Netflix. Once they're all cut out, you're ready to attach them to your bins. We like to hot glue them on because it's fast, easy and the labels stay put all year. You could also use velcro or packing tape works well too. The final piece to your beautiful organized library puzzle is to add a coordinating label to the front of each book in your library. This way, students can easily see where each book belongs and will (hopefully) put it back in the correct bin! Congratulations! 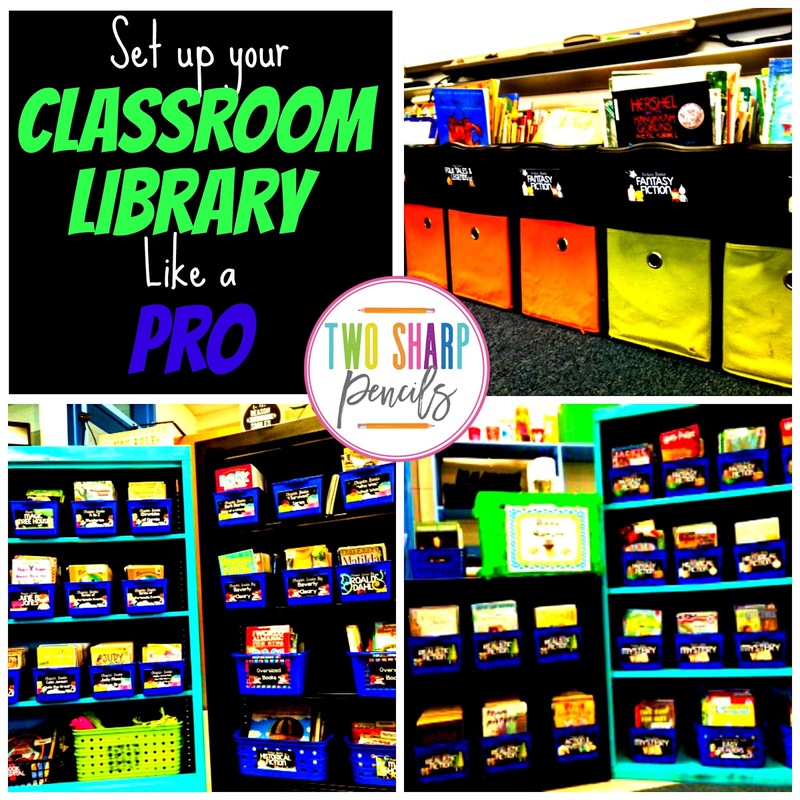 You now have a beautiful, organized and functional classroom library! We hope you've found this post to be helpful. If you have any library tips to add, please leave a comment below, we'd love to hear from you! 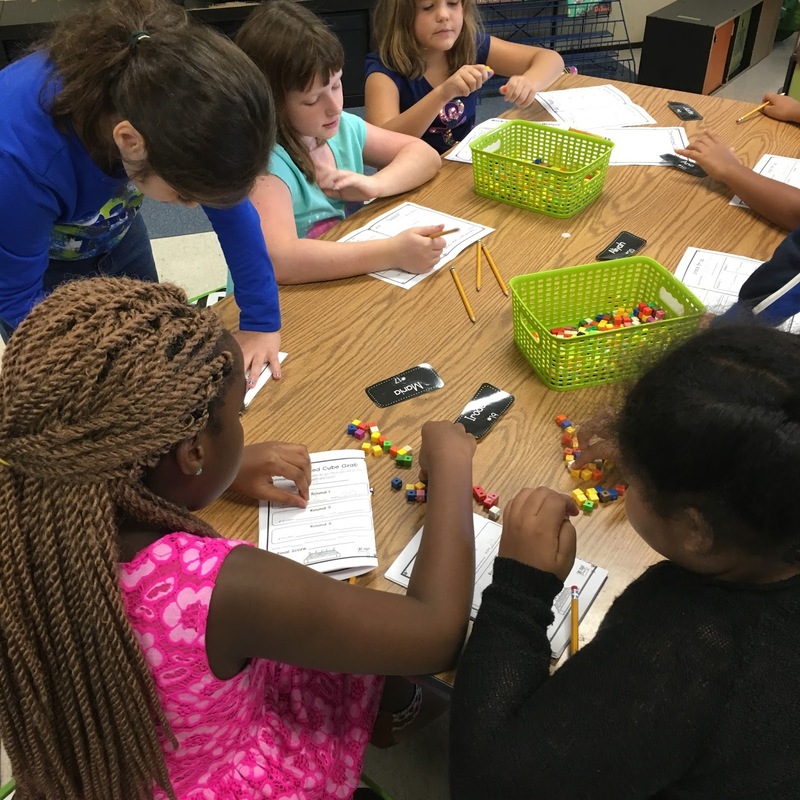 In teaching math to third graders, one of the skills that we always found to be the most difficult was how to teach problem solving. How do you teach an 8 or 9 year old how to carefully read a problem, pull out important information, choose a strategy, solve, check the solution, and explain how they solved it when they can barely sit still for more than 5 minutes!!! And yet that is what we were being asked to do year after year with our students. After honestly feeling like we weren’t doing the best job in getting our students to persevere (we know you teachers out there love to hear that word) in solving problems, we decided that it was time to try something new. And if YOU persevere in reading this blog post, you will find a FREEBIE and a chance to win a giveaway at the end! We thought about what we wanted our students to be able to do as problem solvers. In addition to all of the skills mentioned above, we knew we also wanted them to be able to verbalize how they solved a problem to others, to apply what they learned to new problems, and to even be able to create similar problems of their own. From this desire, our Problem of the Week was born! In the past we had given our students daily math and asked them to solve the problems. Then we would go over the strategies and the answer together as a class. 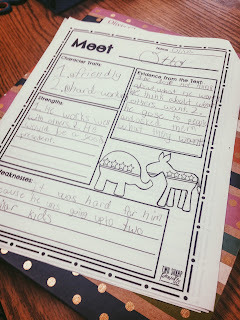 We decided that instead we needed to have our students become more independent in solving problems and in order to do that, they needed a method that they could follow over and over again until it became second nature. 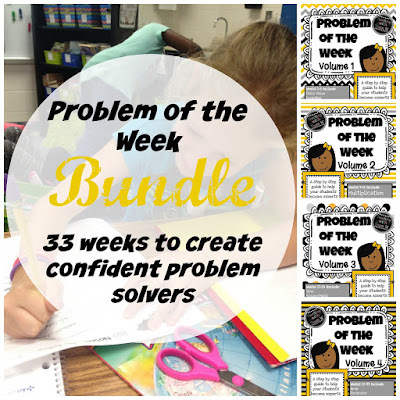 We created this problem of the week so that each day the students would complete a different step in the problem solving process. On Day 1, our students read over the problem independently and complete the CUBES strategy (Circle the key numbers, Underline the question and restate it, Box the clue words, Evaluate, and Solve). Then they do their best to solve the problem on their own. We really try and encourage them to persevere (there's that word again) without providing too much assistance. 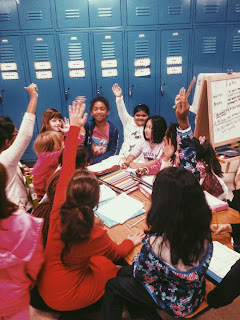 There are times, especially when you first start, that students will come up and say "I can't do this" or "This is too hard" and you simply have to give them a smile and say "Do your best!". 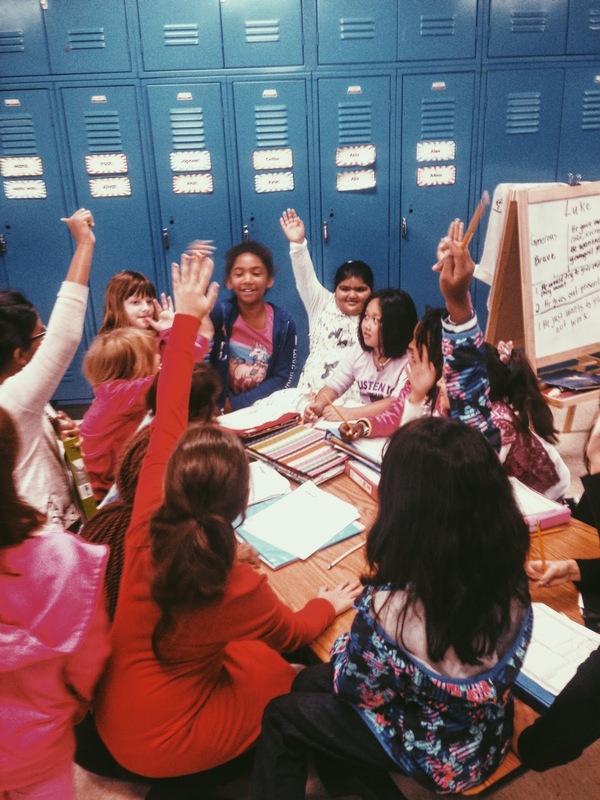 We realize that as teachers this can actually be quite challenging because we want to help our students, but we find that if we always guide them to the answer, they never feel confident enough to try on their own (especially when the BIG test comes along). On Day 2, students work with a partner to compare answers and strategies for how they solved the problem. After discussing their solution, they decide whether or not they want to keep it the same or change their answer. If they decide to change it, they have to show how they solved it differently. This step actually takes a lot of modeling and practice to get the quality work we want from our students. 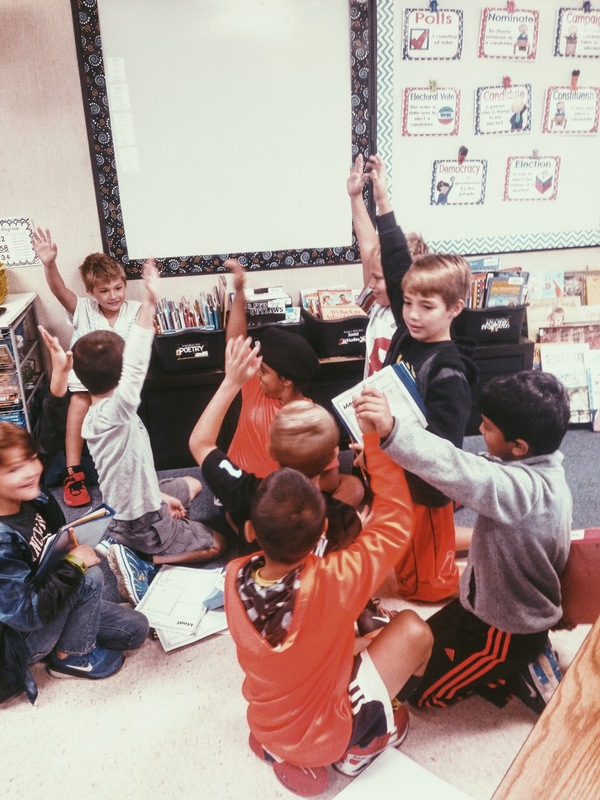 We find that a lot of times students will just mark that they don't need to change anything even though they might have a totally different answer from their partner. Our goal for this step is for students to make a detailed analysis of another student's work, as well as check back over their own. 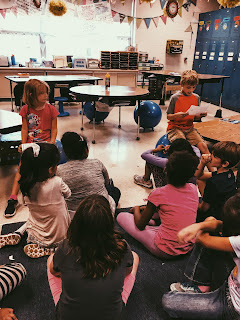 We did see progress in this area as students became more comfortable with the routine and understood our expectations. After this partner talk, we come together as a whole class and actually go over the solution to the problem. 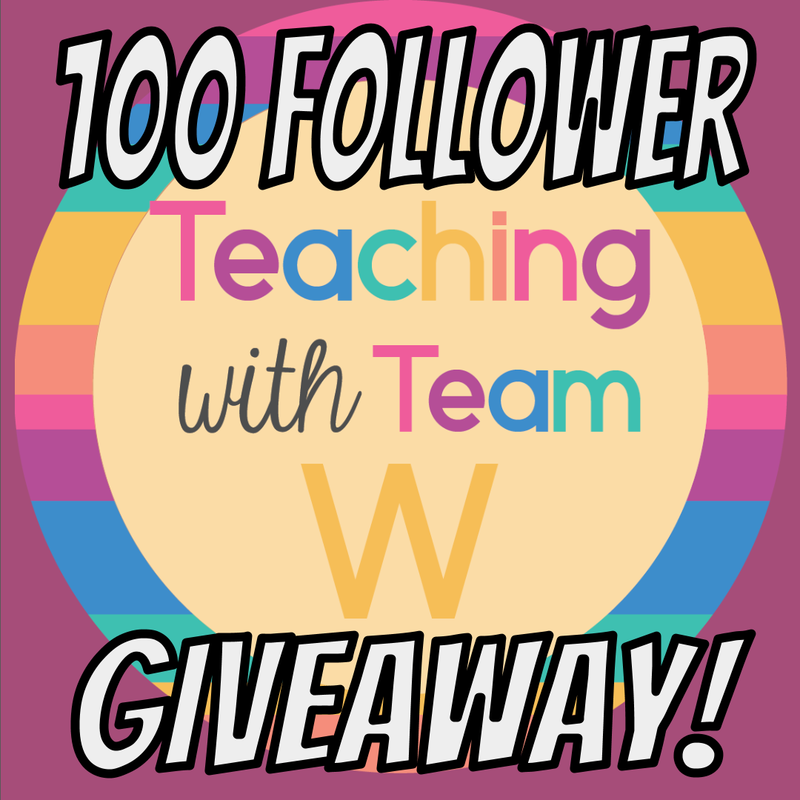 This is an opportunity to see the strategies that students are using, as well as get an idea of where the class is in their understanding of the targeted skill. Day 3 is our explanation day, when the real fun begins! The students are asked to explain their problem solving process in writing. This is usually a very difficult task for students to complete, especially in the beginning of the year, so the written section is scaffolded with transition words to help students structure their responses. 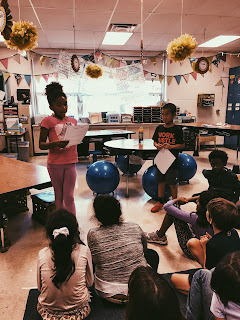 After students finish their explanation, we gather as a class and have several students share, making sure to acknowledge what they did well, as well as provide feedback on what could make their response even better. We also MODEL, MODEL, MODEL and when we don't feel like we can do it anymore we MODEL again! Let us just warn you, at the beginning of the year these are AWFUL! But by the end of the year our students improve by leaps and bounds and can more clearly explain their problem solving process. Okay...on to Day 4! 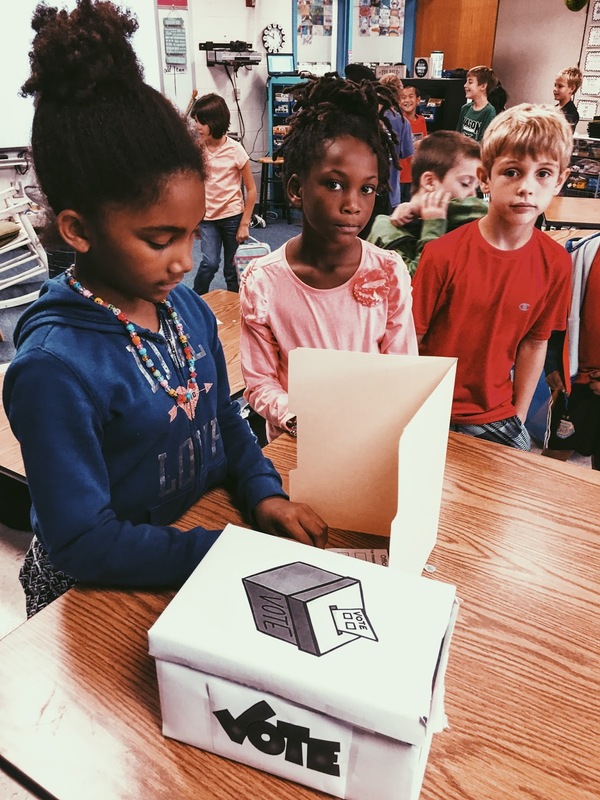 This is usually our students' favorite day of the whole process because they get to show their understanding of the problem in a different way and be creative. On this day the students are asked to create their own problem based on the original problem they solved. 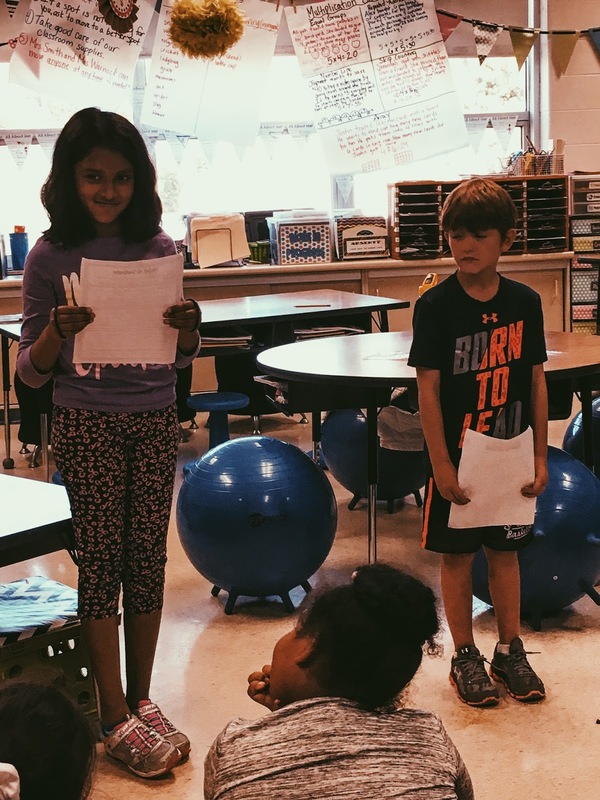 In having them come up with their own problem using the same skill, it shows us that they have a deeper understanding of what they learned throughout the week. They also think it's fun to change the characters or the situation. For example, we shared our love of coffee with the students at the beginning of the year and from then on we saw the theme of coffee drinking teachers show up again and again in our students' problems! 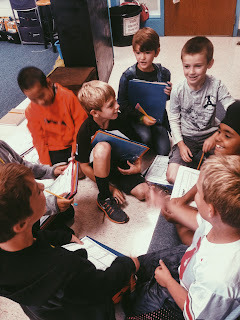 On Day 5, students switch papers with a partner and solve each other's problems. When they return the paper, they check to see if it was solved correctly. Also, sometimes this provides an opportunity to catch mistakes that were made in creating the problem. Whew! Are you still with us? We hope so, because even though this it is quite a journey to get your students to become expert problem solvers, it is well worth the time and effort you put in. The reality is that problem solving is a lifelong skill and these tools will help to set them up for success! 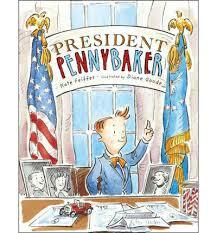 "Super useful for encouraging kids to use persistence in problem solving! Thanks!" "Perfect to beef up my math ideas!" 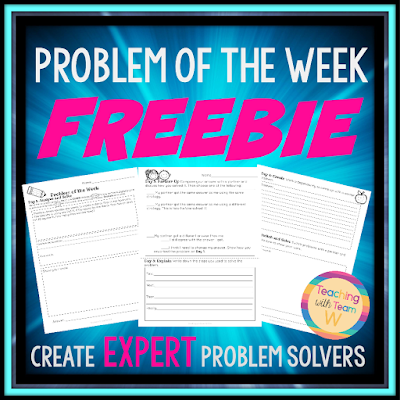 "This is a great way to go deeper into a word problem and encourage student discussion." So...ready to try it in your class? Click on the pic below to get a one week sample for free! But wait...there's more! Enter our giveaway and one lucky winner will receive all four volumes of our Problem of the Week (a $24 value). That's enough to last the whole year! Good luck! Wedding in Jamaica recap and A GIGANTIC GIVEAWAY!!! Hey Everyone! 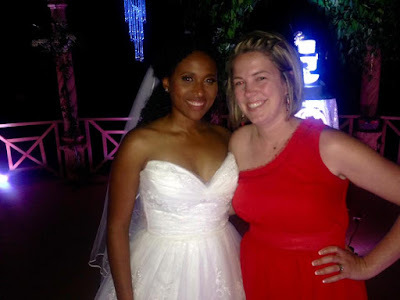 It's been a while since we've last posted, but the End of the Year craziness led right into Wedding craziness for Joy! 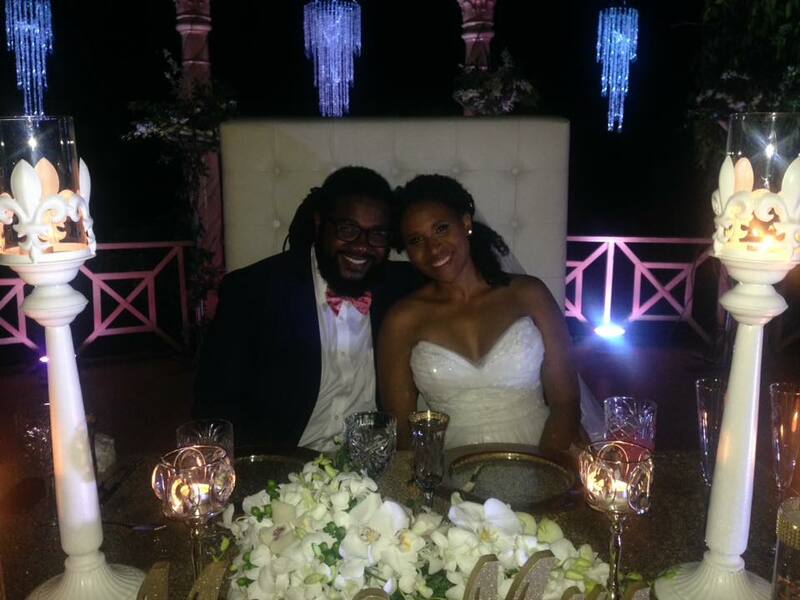 That's right......introducing Mr. and Mrs. Smith! 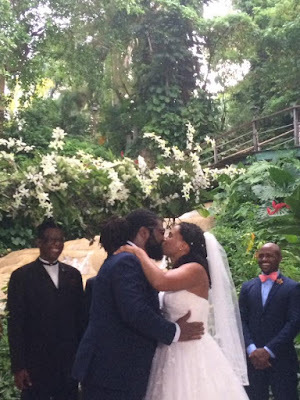 Joy had a beautiful Jamaican wedding right in front of a waterfall! 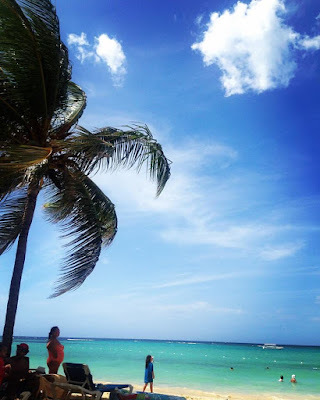 The weather was perfect, the sand was warm and the ocean was exactly what we needed to de-stress after a long challenging year. Can we please go back! We are joining up with Ashley from Ashley's Brainy Centers to help her launch her brand new blog! 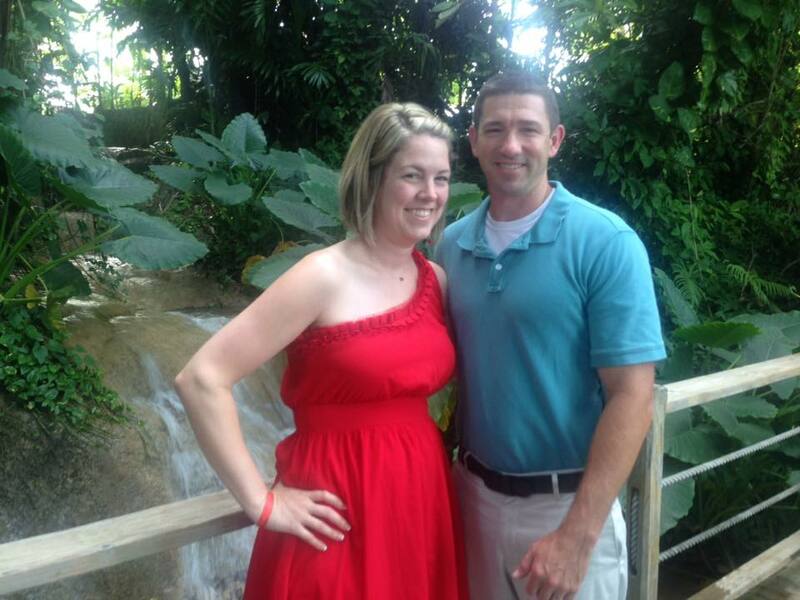 Ashley's got some really cute furbabies and her blog is sure to be a fun one to follow! This giveaway is HUGE guys! 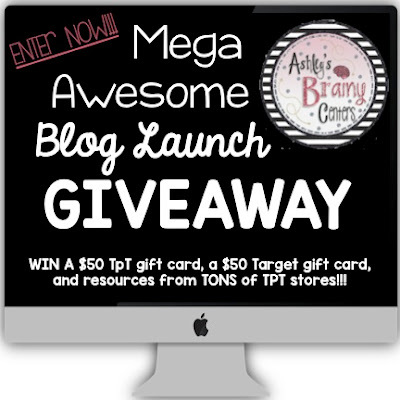 One lucky person is going to win $50 to TPT, $50 to Target and a collection of products from sellers on TPT (including us!) 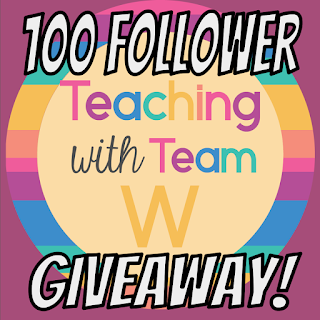 So hop on over to her blog to enter!